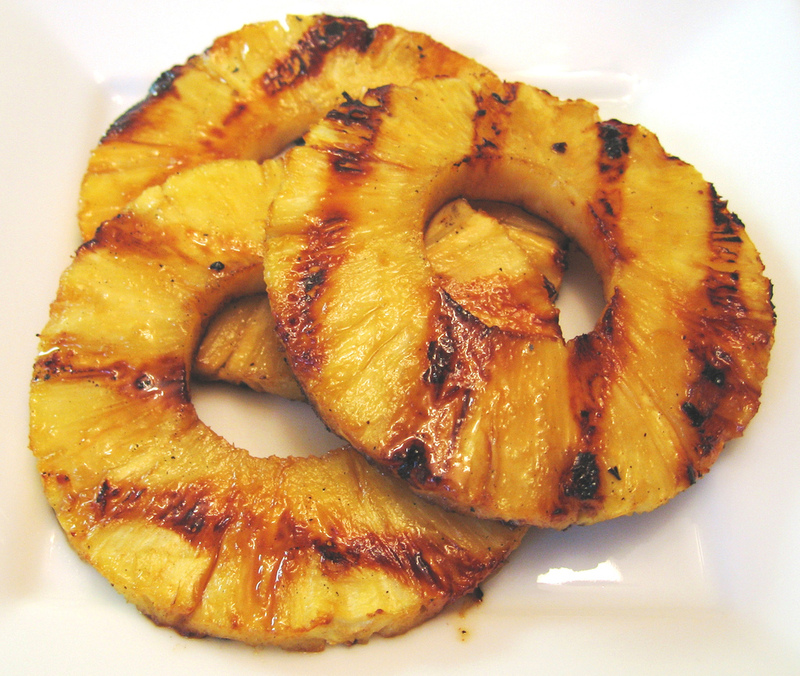 Grilled pineapple has become a must at all barbecues... and sometimes in between. 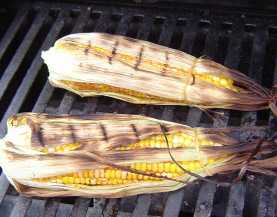 Corn on the cob takes longer to grill then it does to boil. But tastes ten times better. Gift buying for Jeffrey is nearly impossible! Yesterday was wonderful. The weather was perfect! I made Jeffrey take the day off. He wasn't allowed to do anything. He had farting privileges all day. I wouldn't say anything at any time of the day if he chose to stink up the place. He was very happy with that gift. He played and read for enjoyment while I scurried around getting everything ready. The barbecue was a success. Three of our friends came over and celebrated with us. Being guys, they wanted to light a marshmallow instead of a candle. Do boys ever really grow up? I don't think they do. If you ever thought I was cool, please stop reading and continue with your illusions of me. Thank you. After we were filled on good food, we went inside and roll played. I know it is nerdy, and Jeffrey will probably be annoyed that I am letting the world see what nerds we are, but it is time to come out of the closet on this. We roll play once a week, and we love it! Yes, sort of like Dungeons and Dragons, but with house rules and our own version. It is a blast, and I wouldn't miss it for the world. It is often the highlight of our week. Since Jeffrey and I are such opposites on nearly everything, this is a happy meeting ground. Being around friends is a way for me to relax and recharge. Being alone is how Jeffrey relaxes and recharges. But with roll playing, we are both happy. It fulfills my need and desire to get out every week, and he gets to spend more weekends home since I already did something with friends. It doesn't always work like that. I do still need to go out with just him sometimes, but it helps a lot. And now Gary is back, so playing is more of a riot. Ah, good times. And so, my sweet hubby had a dream day for himself. Everything as he would want it. P.S. Don't forget to link up to Time Out Tuesdays! A name will be drawn on Saturday for the next prize! That dinner looks amazing. And delicious. I bet Jeffrey felt very special! Everything looks amazing!! I'm bummed, my son came down with some kind of illness, he's got a high fever and we are canceling his party :( I'm so sad for him but hope we get to rest up this weekend. Lol to the roll playing I'm sure everyone has things they do that are nerdy! I laughed so hard at your nerd alert comment! LOL! you are inspiring me to improve our grill night. FUN! What an awesome birthday! And I'm jealous that you guys are outside in short sleeves... it's STILL rainy and nasty up here. Glad you get a chance for happy medium fun! :) And I still think you are super cool - not nerdy at all! You are just so fun and cool. Wow! You go girl- you are a good wife. That cake is amazing!!! What a wonderful birthday :) Happy Birthday Jeffery! Chris and I are ubber nerds too. In a different form but none-the-less nerdy. We argued economic principal today for 5 hrs on our way home.